Hopper Disassembler is a developer tool designed to assist you in your static analysis of executable files. Thanks to Hopper Disassembler, you can analyze function’s prologues and extract procedural data like basic blocks and local variables. After detecting a procedure, Hopper Disassembler automatically displays a graphical representation of the control flow graph that can be easily exported to a PDF document. More experienced users have the option to expand Hopper’s feature list and even write their own file format and CPU support with Hopper SKD’s help. 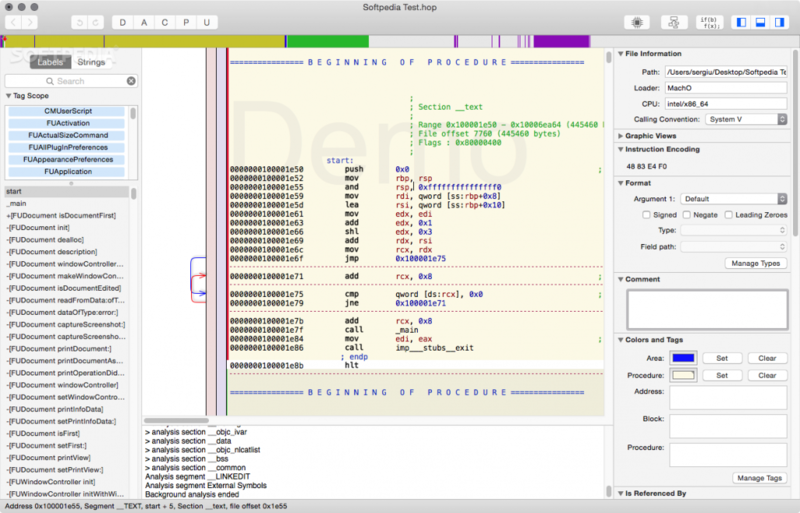 Hopper Disassembler makes it easy for you to use LLDB or GDB in order to debug and analyze the binary in a dynamic way. On top of that, Hopper Disassembler is capable to retrieve Objective-C data such as selectors, strings and messages sent from the analyzed files. Based on the procedures detected in any given executable, Hopper Disassembler displayed a pseudo-code representation. Hopper Disassembler’s main window is divided in three main areas, the left pane that displays the list with symbols defined in the file along with the list strings. The Inspector pane, that provides access to contextual information based on the explored area and the center part where the assembly language can be found. The Navigation Bar is located just above the assembly and enables you to effortlessly navigate through the file by moving the little red arrow. The used color scheme helps you locate various type given to the bytes of the file. As follows, the blue parts represent the code, the yellow areas represents procedures, the purple parts are for the data, the green parts represent ASCII strings and the grey parts are undefined. Some features (such as saving, exporting, and GDB backend) are disabled in the demo mode. Also, sessions are time limited (30 minutes).